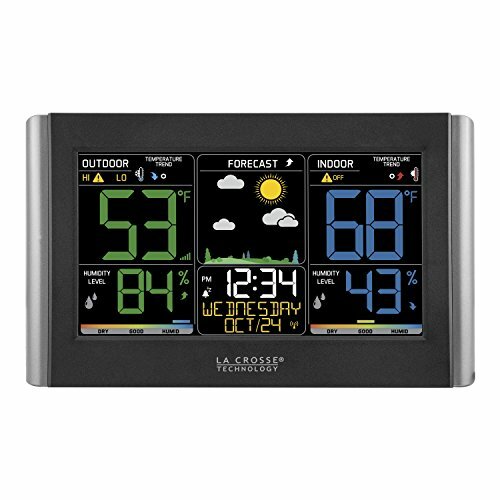 There is more to weather than just temperatures, and having a weather station can give you a lot of info about what’s happening both indoors and outdoors, so let’s take a look at the best weather stations for your RV or home. So what is a weather station? While it might sound like something complicated and expensive, it can be as easy as a screen indoors with a sensor outdoors. This screen can give you all kind of information in addition to temperature. Exactly what information depends on each product, but it’s common that you can read the indoor and outdoor humidity, the weather forecast, the barometric pressure, moon phase, high and low records and also time and date. But wait, you might say, I can do all of this online on my phone or computer already. Well, sure you can. But how accurate is that information? And should you rely on that if you’re out in the woods and need to know if it’s going to be windy to where you should retract your awning? Will your phone warn you ahead of time and alert you when it’s freezing outside that your pipes are in danger? And do you have service everywhere you go? I do know you can find a lot of great weather information online, and if none of these questions make you want to get a weather station, maybe you shouldn’t. But in my opinion, in addition to the safety information it will give you, it’s also fun to track the temperature, humidity and air pressure at the places you go. I get that one product doesn’t fit all, so I am going to share some products that have minimal features, and some that are more advanced and feature-rich. A word you might run into is barometric pressure, and I have answered a question in the FAQ about what it is and how you can be your own weatherman with the information based on it. Most of the products today are supposed to be plugged into AC, so this is aimed mostly towards RV’s that have solar panels or stay at campgrounds where they have access to power. A lot of stations come with a battery slot for backup, but that is for when you move the station so it can keep its data and not lose it. There are ways to only use batteries, and I talk more about this in the FAQ. First out is the ThermoPro TP-60S which is in comparison to the others a very simple weather station. If all you need is temperature and humidity both indoors and outdoors, and records about the All time/24 hours max & min of them, this is it. It comes with a wireless sensor that you can put up to 200ft away from the receiver, and you can connect up to three sensors to one receiver. You can put the receiver on a table or hang it on the wall. It will also give you some trends in arrows pointing up or down. This is to quickly tell you whether the value has been increasing or decreasing lately. The humidity range it can read is 10% to ~ 99% and ThermoPro promises an accuracy of +2% between 30% and 80%, +3% below 30% and above 80%. The temperature range is between -4°F to 158°F indoors, and -58°F to 158°F outdoors. 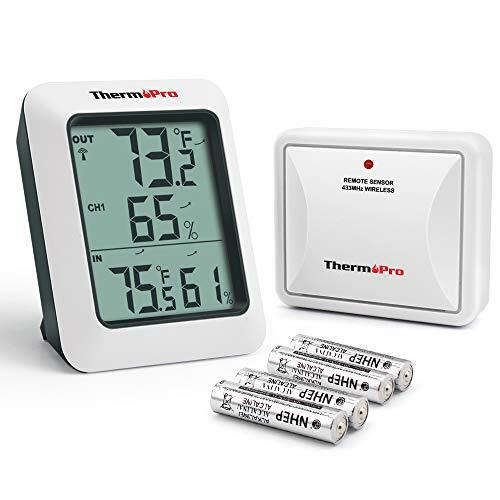 With such great range, the ThermoPro TP-60S will be enough for most people that don’t believe they need any additional weather info. I would have liked to see a simple forecast image, but for the price I can’t complain. With a sensor this size you can easily monitor the temperature in your storage compartment, and since you can buy two additional sensors and put them in different places, you can get a lot of information on one display. La Crosse Technology is an American company that wants to bring technology, time, and weather together and have done so with a lot of their products. The one product I have decided to take an extra look at today is the model C85845 weather station. It has an adjustable backlit colored display that will give you some more information than the basic temperature and humidity. Other than that info for indoors and outdoors, it will give time and date, a forecast, trends, and customizable alerts based on temperatures and humidity. You can choose to plug it in with the included AC adapter, but also use with AAA batteries. As mentioned before, I recommend plugging it in when possible, as the batteries are there for backup and not for 24/7 use. When using batteries the screen will turn itself off but can be turned on with a push of a button, so it depends on you as a user as well and what you want. The humidity range it can read is 10% to 99%. The outdoor temperature range is between -40˚F to 140˚F if you use lithium batteries. So what makes it worth it over the ThermoPro TP-60S? Well, you either like the colored design or you don’t. It has a more information filled screen which means it will be using more power. You have an adjustable backlight display that you can either set to off, low or high to save battery. The La Crosse Technology C85845 also has a wireless range of 300 ft vs. ThermoPro’s 200 ft. The customized alerts you can set can be worth a lot if you camp in cold weather where you have to worry about pipes freezing. 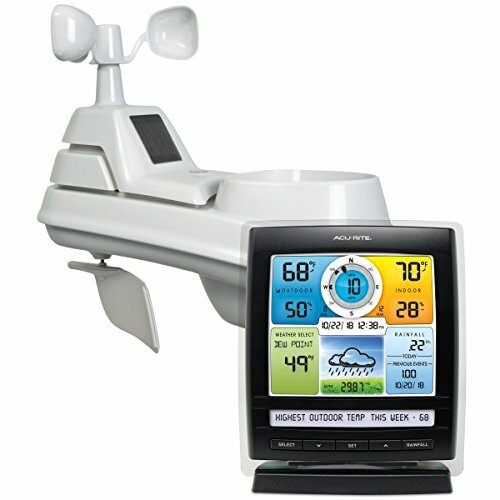 AcuRite is another popular company that has a lot of weather stations on the market. I am taking a look at one of their more simple ones and one more advanced. Starting with the model number 0227A1. It has a color display and displays a picture behind the forecast. The AcuRite 02027A1 will run on AC power and batteries and has an adjustable dimmer for saving energy. For features we have temperature and humidity with low and high records, also showing trends pointing up or down. A barometric pressure reader will show pressure on the screen, together with the moon phase, time and date, and a forecast. AcuRite 02027A1 has, in my opinion, the best looking screen in today’s comparison. Unfortunately, it’s missing alerts. The second AcuRite product today is the model number 01512. This is a more advanced weather station thanks to its big sensor that has more features than just temperature, barometric pressure, and humidity. The sensor together with the colored display will tell you about rain and rainfall history, wind speed and direction, temperature, humidity, forecast, barometric pressure, and high and low records. It will also show the dew point which is the temperature at which air is saturated with water vapor. Below the dew point is where water will begin to condense on solid surfaces. You could put this on top of your RV roof to get information about windy weather and whether you should retract your awning for example. The sensor can track wind speeds up to 99 MPH and will also show you the direction not only at the moment but the two previous directions as well. The display likes to be plugged into the wall with its AC adapter but can run off of batteries for backup. The sensor features a 2-year battery life. What makes this and the next product special in addition to the extra features are the buttons on the front of the display to change what is shown. Some other products have buttons to do this on the back which means you have to take them down if it’s hanging on the wall. My favorite feature on the AcuRite 01512 is the information below the screen where you can scroll through different pieces of information, like the highest temp outside that week, what the “feels like” temperature is, etc. 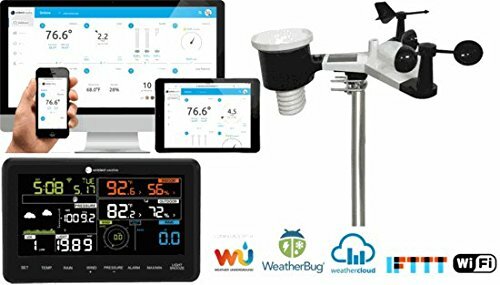 The most feature-packed weather station in today’s comparison is from a company called Ambient Weather. It’s a 10-in-1 station with internet monitoring and it’s even compatible with Amazon’s smart assistant Alexa. Wind speed and direction, rainfall, outdoor temperature, humidity, solar radiation, UV, barometric pressure, dew point, and wind chill and heat index are all part of what you can do with this weather station. As with most other stations, you should be plugged in with the AC adapter which only consumes 0.5 Watts (1.25 during WiFi configuration mode). You will be able to get information from the station remotely through the internet. Note that the station must be connected to the internet to be able to share this info. This can be done with a product like the Verizon Jetpack MiFi if you have service. Something that can be useful for most people is the smart alerts you can set, which delivers to you in both texts and emails. I hope I have cleared up a bit about what makes one weather station different from another and guided you in the right way to what you need. You don’t necessarily have to spend a lot of money on a good weather station, but you do get more features when you pay more. To install a big sensor to your RV roof can seem a bit scary too, so while features like wind and rain sensors are cool, the installation of the sensor is something to take into consideration. A great use with a smaller sensor is that it can be put in small places depending on where you want temperature readings. I know people that put them in certain areas to make sure their pipes don’t freeze. 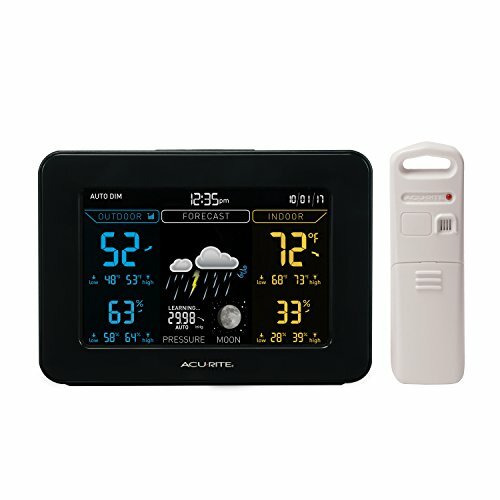 Good: AcuRite 02027A1 – If you want a weather station that tells you the temperature, humidity and forecast in a neat package, this is it. The ACuRite 02027A1 will let you know, based on barometric pressure, what the forecast is. This is a good choice for RVers. Better: AcuRite 01512 – A step below the Ambient Weather model is the AcuRite 01512. This will of course tell you temperature, humidity and give you a forecast, but it will also let you know how windy it is and how much it has rained. Put this on your RV and you can be your own weatherman, just remember to take it down before hitting the road. Best: Ambient Weather WS-2902A – The Camping Nerd Favorite. With so much tech and features built-in, this is impossible not to recommend. Yes, you have to put it on your RV outside and have access to WiFi to be able to view the data on your phone, but when set up, nothing beats it. Ask Alexa about the weather and she won’t look it up online, but look at your own weather sensor outside, we’re in the future. Why do I need a weather station for my RV? To be able to forecast how the weather is going to be when you travel around in an RV is useful, in my opinion. To know about whether you should pack your gear in because significant pressure changes are hinting that a storm is approaching, or if the wind has changed its direction and a storm nearby might be heading your way. It’s not just for fun, but for the safety of you and the people around you. Being prepared is always important. A weather station will give you temperature and humidity levels indoors which will help you regulate to prevent mold and bacteria growth as well. Is it enough to have a weather station to predict the weather? No weather station is 100% accurate. When you first buy a weather station, you should try to get to learn it. See what it tells you and what is the reality outside. I also recommend getting an NOAA Weather Radio for emergencies and alerts. Your weather station might malfunction and show incorrect information so having several sources will make you safer. How accurate is a forecast on a weather station? I believe the weather stations that have a forecast feature base it on the change in barometric pressure. You can read below about what the barometric pressure is. Some have forecasts based on past weather and results of pressure changes. Like with any estimates, they’re not 100% accurate but will give you a general idea about what you should prepare for. Can I run a weather station on batteries? Most stations we looked at today come with an AC adapter that is recommended to power the receiver unit and its display. Most of them have space for batteries to have a backup for if you want to move the weather station without losing the data it has collected. This can be a problem in an RV where you don’t have power everywhere you go unless you have solar panels. You can get a station that turns off the display while on batteries and has to be interacted with to brighten up and then plug it in on occasion to change the batteries, or you can look into solar panels or an inverter. With solar panels and an inverter, you could wire your outlets to be run by the battery in your RV and then a solar panel would make sure you don’t run out of juice. Barometric pressure, often called atmospheric pressure is what it sounds like, the pressure in the atmosphere. When the air pressure rises, the air sinks and increases the pressure on the earth and clears the sky as the barometric pressure is high. When it falls, the air is rising away from the surface of the earth and now we have low pressure which often means clouds and rain. The lower the pressure, the worse the weather. If your weather station shows barometric pressure, you might see a number that says 29 something. 29.92 inches Hg is the standard atmosphere pressure where inches Hg is the measurement of pressure. If your weather station shows a number over 29.92 it means that the pressure is high, and if it goes below 29.92 it means that the pressure is low. With this information you can be your own weatherman and predict depending on the pressure how sunny or cloudy the skies will be.